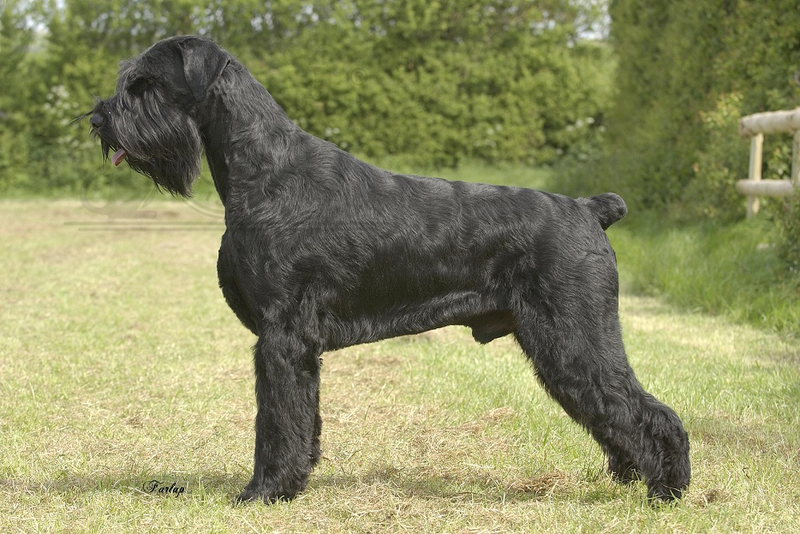 The first Giant Schnauzers emerged from Swabia in the German state of Bavaria, and Wurttemberg in the 17th century. These original Giant Schnauzers were considered a rough-coated version of the German pinscher breeds, and their hair was thought to help them withstand the harsh German winters and bites from vermin. The origins of the breed are unclear, but sources speculate it originated through some combination of black Great Danes, German Shepherds, Rottweilers, Dobermans, Boxers, Bouvier des Flandres, Thuringian Shepherds, and the Standard Schnauzer. The Giant Schnauzer was originally bred as a multipurpose farm dog for guarding property and driving animals to market. By the turn of the 20th century the Giant Schnauzer was being used as a watchdog at factories, breweries, butcheries, and stockyards throughout Bavaria. It was unknown outside Bavaria until it was used as a military dog in World War I and World War II. The first Giant Schnauzers were imported to America in the 1930s, but they remained rare until the 1960s, when the breed became popular. In 1962, there were 23 new Giant Schnauzers registered with the American Kennel Club; in 1974 this number was 386; in 1984 it was over 800 and in 1987 is was around 1000 animals. In 2012, there were 94 new dogs registered, down from 95 in 2011. In modern times, the Giant Schnauzer is used as a police dog; is trained for obedience, dog agility, herding, search and rescue, and schutzhund; and is shown in conformation shows. They are also used for carting. In Europe, the breed is considered to be more of a working dog than a show dog. The focus in many European Schnauzer clubs is not so much on conformation shows, but on the working ability of the breed. In several countries, including Germany, dogs must achieve a Schutzhund Champion title before they can qualify to be a conformation champion.